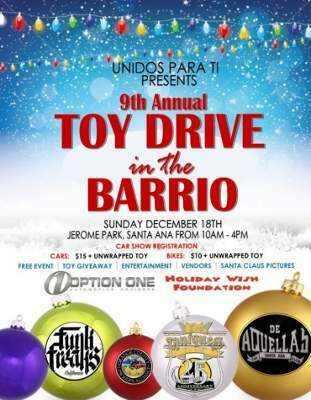 Unidos Para Ti is hosting their yearly community event, the 9th Annual Toy Drive in the Barrio, on Sunday, Dec. 18, 2016, from 10 a.m. to 4 pm, at Jerome Park, located at 726 South Center St., in Santa Ana. 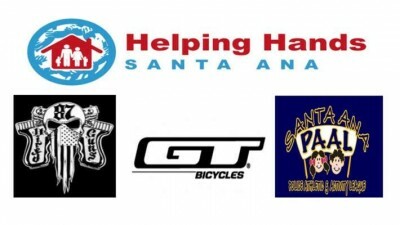 Santa Ana police toy drive needs toys! 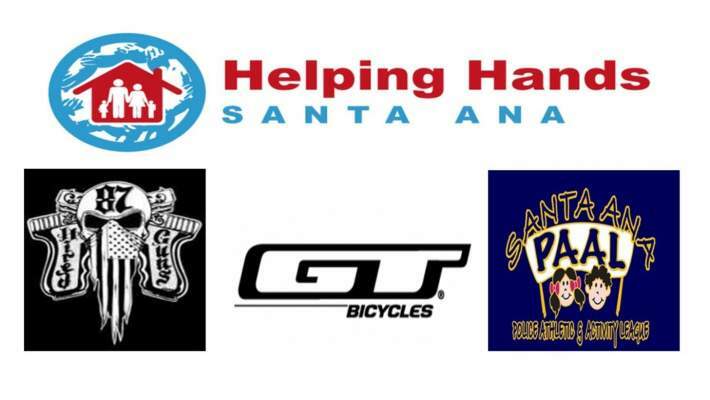 Helping Hands Santa Ana, Hired Guns LEMC and GT BMX Bicycles will host their 5th Annual Toy Drive for the Santa Ana Police Athletic & Activities League (SAPAAL) to benefit those families in need during the upcoming holiday season. 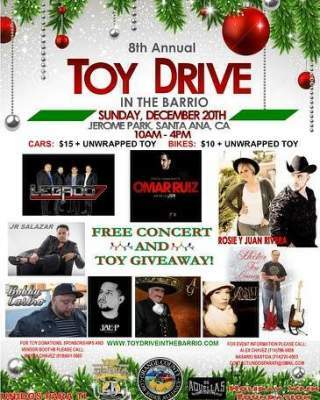 A holiday toy drive in the barrio will be hosted by Unidos Para Ti and the OC Lowrider Alliance at Jerome Park on Sunday, Dec. 20, from 10 a.m. to 4 p.m. The National Hispanic Business Women Association is hosting their Annual Holiday Mixer and Toy Drive on Tuesday December 11, 2012 at 5:00 pm, at the Rancho Santiago Community College District, located at 2323 North Broadway, in Room 107, in Santa Ana. 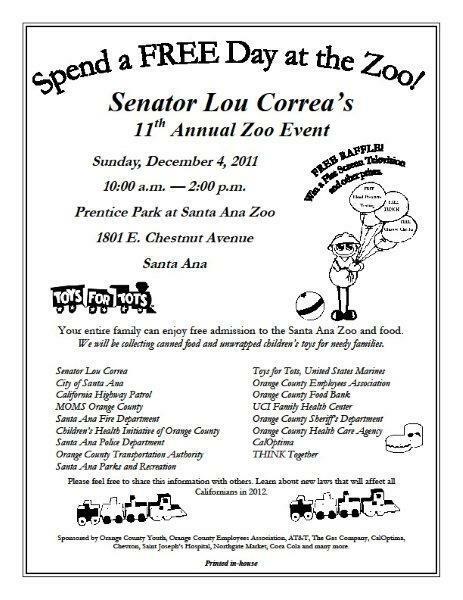 State Senator Lou Correa is hosting his 11th Annual Santa Ana Zoo event today. He will be collecting unwrapped toys, for needy kids, and canned food. Kick-off your holiday celebrations with free admission to the zoo, lunch, games, performances, and much more until 2pm today with Senator Correa at the Santa Ana Zoo. Toys are desperately needed in Orange County this Holiday Season and all OC Fire Stations are collecting toys. Please help! The toy warehouse, which is staffed by volunteers, is ready to fill orders for toy distribution but is in dire need of new unwrapped toys and gift cards. With the poor economy and people without jobs, the need for toys this year is up dramatically. Right now it looks like they just don’t have enough donations. Please do what you can to help! You can donate online with a credit card through the California Community Foundation (CCF). All proceeds will go to buying toys or sports equipment for the children. And you can also drop off your new, unwrapped toys or sports equipment at your local Fire Station or CVS/pharmacy. For 18 years, ABC7 and firefighters from Los Angeles, Orange, Riverside, San Bernardino and Ventura counties, along with the Los Angeles City Fire Department, have joined forces to run the “Spark of Love Toy Drive”. This campaign collects new, unwrapped toys and sports equipment for the under served children in our communities. Toys collected in the respective counties are distributed locally. Last year alone, “Spark of Love” collected over 500,000 toys within all five counties and we want to top that total this year, so please help the firefighter’s ignite a spark of love in a child’s heart. This year there will be four Stuff-A-Bus events. On four days in November and December, from 5 a.m. to 6:30 p.m., you can help ABC7′s Garth Kemp (dressed as a giant elf) stuff a bus full of toys. 5 a.m. to 6:30 p.m. The United Mexican-American Veterans Association plans a holiday lunch and toy drive on Saturday, Dec. 11. It takes place from 11 a.m. to 1 p.m. at American Legion Post #132, 143 S. Lemon St., Orange. See http://umava.org or contact Francisco J. Barragan at commander@umava.org. Please bring a WRAPPED Toy for the Toy Drive (make a note to let us know if it is for a boy or girl). They will also be conducting a small ceremony – Pledge of Allegiance; Prayer/Invocation; and Oath of Office for new UMAVA Board and Officers. Love to All, Inc. is a non-profit organization committed to ending the cycle of child homelessness in Mexico by assisting orphanages and the children they support. Join them on Friday, December 3, from 7:00pm – 11:30pm, for the El Jugueton Toy Drive, located at 2035 N. Main St., in Santa Ana. Ticket are $35 dollars and will include food and entertainment till 12pm for the event. Entertainment includes a performance by Relampago del Cielo, a non-profit cultural arts organization which supports the study and preservation of traditional Mexican performing arts through our music, folklore and dance. Also performing is the Rhythmo children’s mariachi band. Remember, this program is to help the kids! Also, there are corporate sponsorships available for $250. This includes your business being advertised as a sponsor on the radio, on our website and other promotional items. Please call for more information on ticket sales at 818-635-3159. Click here to RSVP on Facebook. Click here to buy your tickets online. For the last eighteen years, ABC7 & Southland Firefighters have come together to bring smiles to children and families in need. The Spark of Love Toy Drive benefits children who have lost their homes to fire, whose parents are unemployed, live in underserved communities, are in the foster care system and/or are hospitalized. 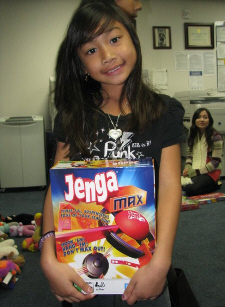 With the love and support from sponsors, donors, and volunteers children will be able to enjoy a new toy this holiday season. This year’s toy drive will run from November 19th thru December 24th. As in previous years, a new unwrapped toy or sports equipment can be dropped off at any local fire station or sponsor location. Firefighters from Los Angeles, Orange, Riverside, San Bernardino and Ventura counties along with Los Angeles City Fire will collect toys and distribute them to under-served children in their local communities. 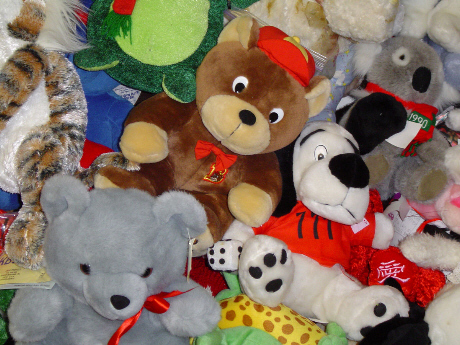 In the last four years, over 2 million toys have been collected and distributed. And starting Friday, November 19, you can also drop off your new, unwrapped toys or sports equipment at your local Fire Station or CVS/pharmacy. This year there will be four Stuff-A-Bus events. On four days in November and December, from 5 a.m. to 6:30 p.m., you can help ABC7’s Garth Kemp (dressed as a giant elf) stuff a bus full of toys.